The Optoma HD25-LV Projector is Optoma HD25-LV Projector with 3200 ANSI Brightness. For owner of this projector, you can download the manual in pdf format. It's available in english language. It's devided into 5 section. To read this user manual you must using PDF applications like Adobe Reader or Foxit Reader or yoiu can using Google Chrome browser. 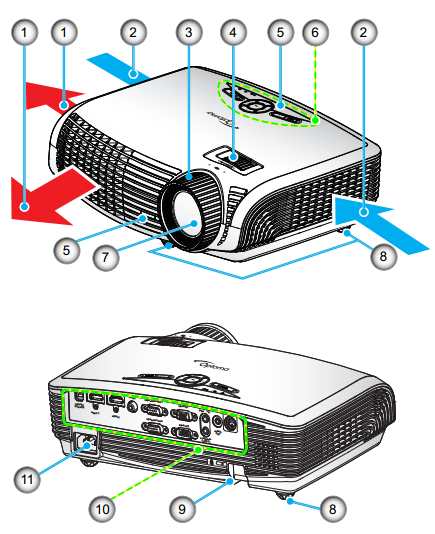 The Optoma HD25-LV Projector User Manual provided detail reference information such as about safety, projector layout, remote control overview, Connecting the Projector, Connect to 3D Video Devices, Using the 3D glasses, tutorial Powering On/Off the Projector, Adjusting the Projected Image, On-screen Display Menus, setup guide, and Troubleshooting guide. If you experience a problem with your projector, please refer to the following information. If a problem persists, please contact your local reseller or service center. Ensure the pins of connectors are not crooked or broken. Check if the projection lamp has been securely installed. Please refer to the “Replacing the Lamp” section. Make sure you have removed the lens cap and the projector is switched on. When you play anamorphic DVD or 16:9 DVD, the projector will show the best image in 16: 9 format on projector side. If you play the LBX format DVD title, please change the format as LBX in projector OSD. If you play 4:3 format DVD title, please change the format as 4:3 in projector OSD. Please setup the display format as 16:9 (wide aspect ratio type on your DVD player. Adjust the zoom lever on the top of theprojector. Move the projector closer to or further from the screen. Press “3D Format” button and switch to “Off” to avoid normal 2D image is blurry double image. Press “3D Format” button and switch to “SBS” for input signal is HDMI 1.3 2D 1080i side-by-side. Check if the battery of 3D glasses is drained. Check if the 3D glasses is turned on. When the input signal is HDMI 1.3 2D (1080i side by-side half), press “3D Format” button and switch to “SBS”.